Why do farmers in Maharashtra turn to govt with omnibus demands? Thousands of farmers, peasants and workers carrying red flags and wearing red T-shirts and saris, marched amid rain and Delhi traffic on Wednesday to demand farm loan waivers, an end to “anti-labour policies of the Narendra Modi government” and better minimum wages. They also protested the “communal and divisive agenda” of the government and atrocities on the Dalit community. The march, from New Delhi’s Ramlila Ground to Parliament Street, comprised agricultural workers, farmers and factory workers from across the country. Left leaders said it was a rare occasion that farmers, agricultural workers and organised sector workers have come together to jointly march for their rights. The Mazdoor Kisan Sangharsh Rally was organised under the banners of the Centre of Indian Trade Unions (CITU), All India Kisan Sabha (AIKS) and the All India Agricultural Workers' Union (AIAWU) — all three outfits affiliated to the Communist Party of India (Marxist). 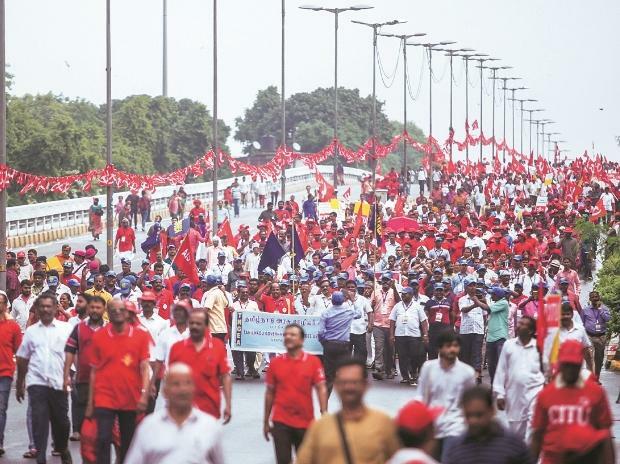 Wednesday’s march was part of the Left unions’ ‘independent action’, as was the ‘long march’ of farmers from Nashik to Mumbai in March. In between, these organisations had also collected over 10 million signatures against Modi government’s economic policies and courted arrest across the country on August 9. The Congress party issued its support to Wednesday's march. A couple of thousand of the participants in the march from Maharashtra had walked from Nashik to Mumbai in the ‘long march’ as well. Swaroop, 25, and his friends travelled from Kerala’s Palakkad to New Delhi on motorcycles to take part in the march. There were farmers and workers from West Bengal, Chhattisgarh, Punjab, Haryana, Rajasthan, and others parts of the country.